Fraught with feelings of self-doubt and hopelessness, as great warrior collapses in self-defeat, posing questions for his charioteer, just before the immense battle begings on the plain of Kuruksetra. 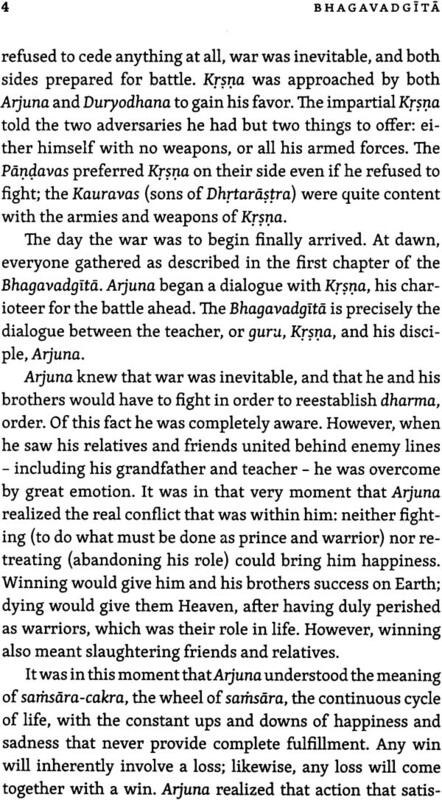 It is as if there was an interruption of the epic story of the Mahabharata, which pauses dramatically for the dialogue between teacher, Sri Krsna, and his disciple, Arjuna, which is known as the Bhagavadgita. 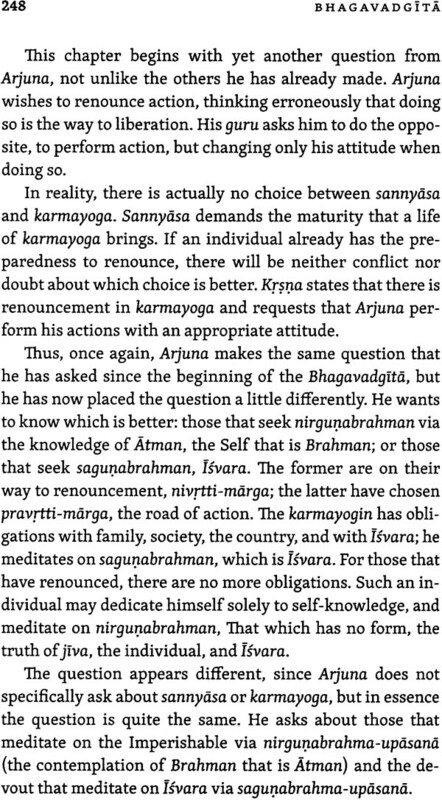 This dialogue has been handed down as part of the oral Vedic tradition in an unbroken line of Knowledge for more then 5000 years, And despite such antiquity, Arjuna's questions remain just as relevant today, because the human sense of insufficiency and desire for fulfilment are timeless. 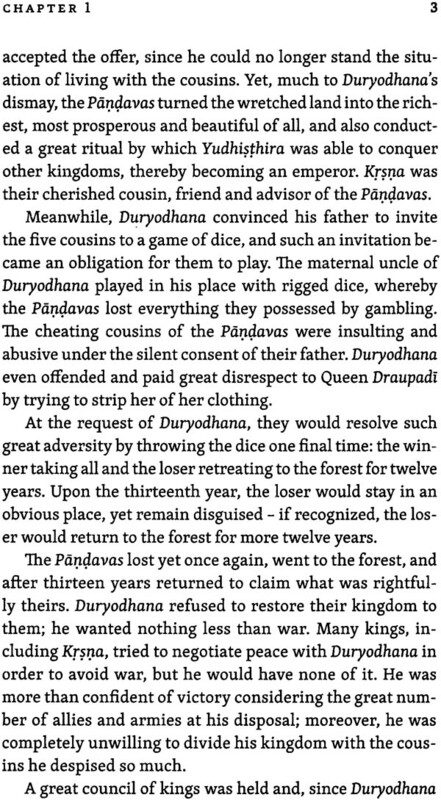 Fortunately for Arjuna – and all off us – the solution is also timeless. Sri Krsna teaches him the knowledge about the ultimate truth of the Self, the essential nature of the human being covering the topics of dharma (appropriate action to fulfill what must be done) and yoga (to do so unmoved by the results of such action), while keeping a vision of Isvara (the Cause and the Order that is the Universe) in order to attain moksa, final liberation from the human sense of limitation. 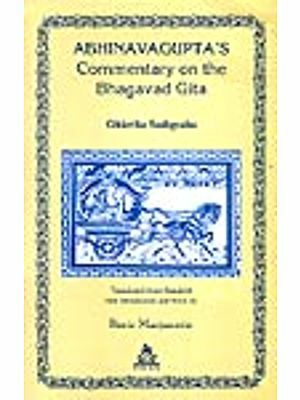 With an unwavering dedication to the original Sanskrit and to the tradition of Advaita Vedanta, Gloria Arieira unfolds the beauty and clarity of the message that is the Bhagavadgita, the very knowledge of the Self that removed Arjuna's confusion, allowing him to rise to his feet once again. Gloria Arieira studied Vedanta, Sanskrit, Vedic chanting, and meditation in India between 1974and 1978, under the guidance of Swami Dayananda Saraswati, at the Sandipani Sadhanalaya ashram in Mumbai, and in two other ashrams in Rishikesh and Uttarkashi. Her pilgrimage has led her throughout the years to several temples and holy sites around India, including Gomukh, Gangotri, Badrinath – the cavern where Vyasa wrote the Mahabharata – and Jyoshimath, the center for study founded by none other than Sri Sankara himself. For more than 30 years, she has taught Vedanta and Sanskrit regularly at her center for Vedic stuies, Vidya Mandir, in Rio de Janeiro, as well as at other institutes throughout her native Brazil and in Portugal. She has translated and published many books on Vedanta into Portuguese. The Bhagavadgita is most renowned Hindu text in the West. 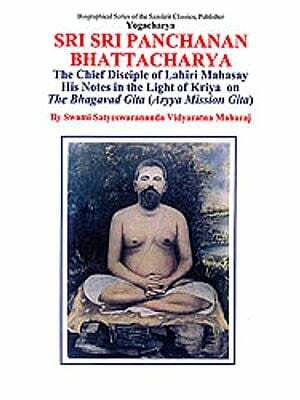 Bhagavat means "he who possesses wealth", meaningthe Lord; the word Gitam, which is neutral, means "song". 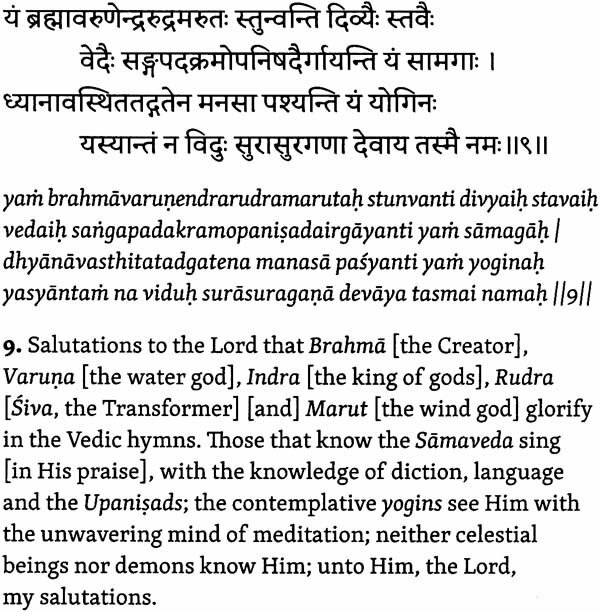 The compound word Bhagavadgita, where t converts to d for phonetic reasons, means "the Song of the Lord" and becomes feminine, since it is a text that feeds our soul, as a mother feeds her child. In the West, for the sake of clarity, the title is often separated into Bhagavad Gita. It is also often referred to as the Gita. The very first translation to a Western language was the "Bhagavat-geeta, or Dialogues of Kreeshna and Arjoon", published in 1785 in London by Charles Wilkins, who had originally gone to India in 1770 as a writer and typographer of the East India Company. His facility for languages allowed him to learn Bengali and Persian quickly. In 1784, he moved to Varanasi, where he began studying with a pundit and dedicated himself to translating the Mahabharata (the epic poem of which the Gita is part), which he did not conclude. He later created the first printing font for Devanagari (the characters traditionally used to write in Sanskrit), just as he also created for Bengali and Persian. In 1808, he published the "Grammar of the Sanskrita Language". 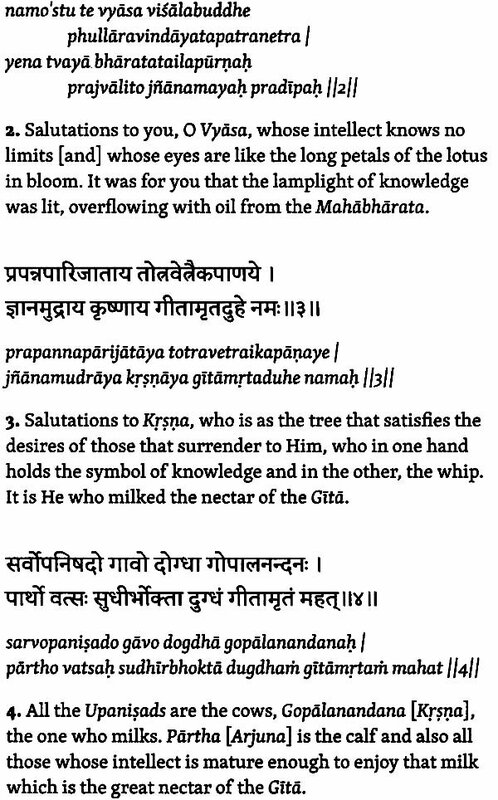 The Wilkins translation of the Gita was then translated into French (1787) and German (1802), and had a great influence in European literature of the period, as well as increasing interest in Hindu philosophy. 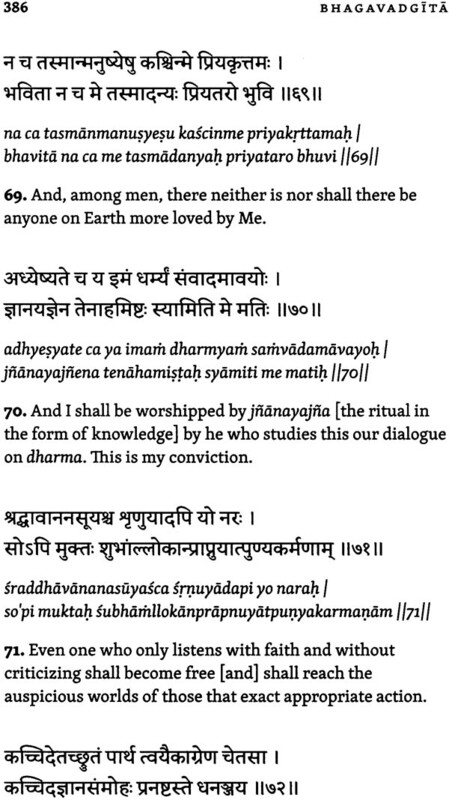 The first translation directly from Sanskrit into German, by Friedrish Schlegel in 1808, contained parts of the Gita. His brother, August, published the journal Indishe Bibiothek (1823-1830), which included translations of the GIta and the Ramayana (another eminent Hindu epic). These texts marked the beginning of Sanskrit studies in Germany, which later developed enormously, and the texts of Hinduism influenced the German writers and philosophers. What had fascinated Wilkins, the brothers Schlegel, and countless other Westerners before and afterwards was the facility with which the Gita speaks to the hearts of men. Arjuna's questions and self-doubt, as well as the best way to proceed with his life, are the very same questions of each and every one of us. The barriers of time and space are immediately overcome as we feel ourselves into the place of Arjuna, paying close attention to the explanations of Krsna. 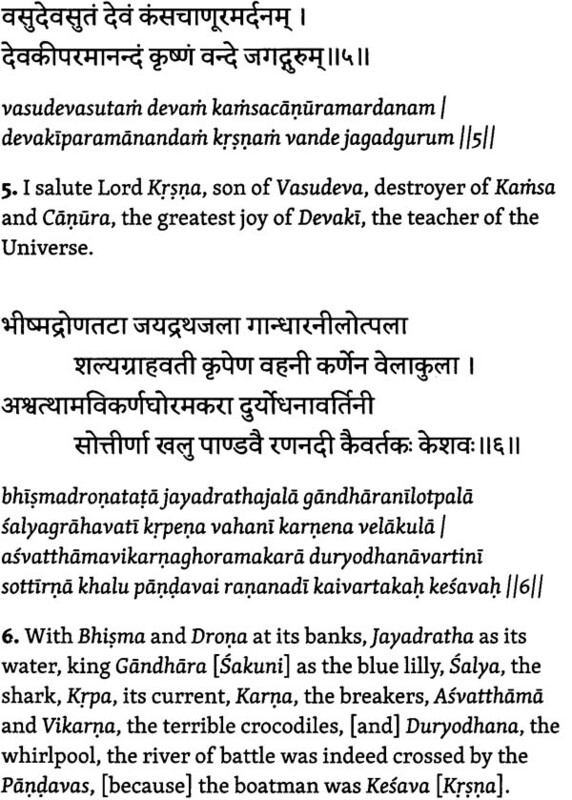 Some academics place the composition of the Gita between the 5th and 2nd centuries BC. 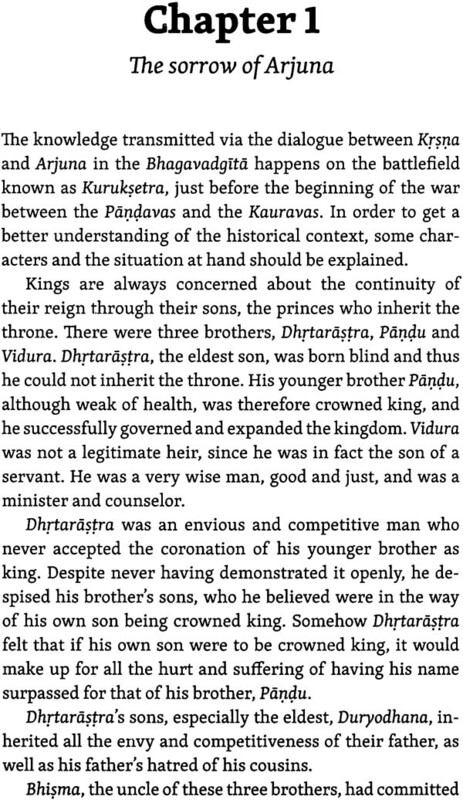 Others, based on differences in literary style, argue that the Gita had been added to the Mahabharata afterwards. The authorship of the Mahabharata, and thus the Gita, been attributed to Vyasa. This preoccupation with establishing dates and authors is typical of the Western culture, since we see the individual as separate from the Whole. Hinduism has an oral tradition of transmitting knowledge from one generation to the next with incredible precision over thousands of years. The Brahmins taught their children from an early age to recite the Vedas by heart in the exact meter and precise intonation. The four Vedas (Rg, Yajur, Sama and Atharva) are called Sruti, "that which has been heard". Only much later in history were these texts written with a stylus on banana leaves. The beginning part pf each Veda, called Kerma Kanda, deals with actions and their results. 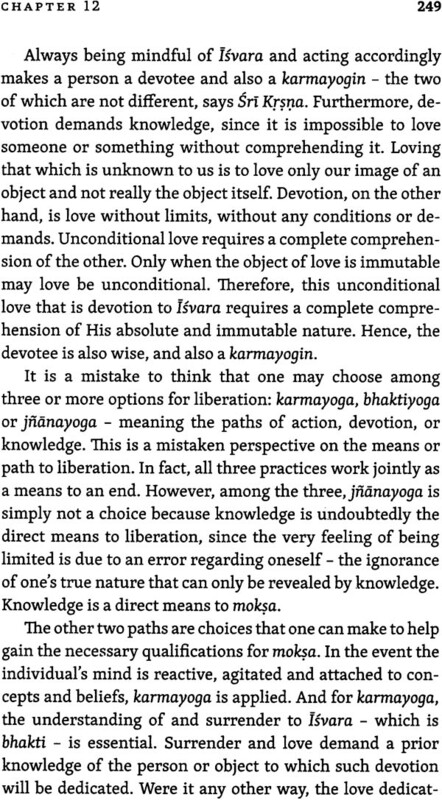 The final part, called Jnana Kanda, covers the topics of knowledge of the individual, the Absolute, and the relationship between the two. 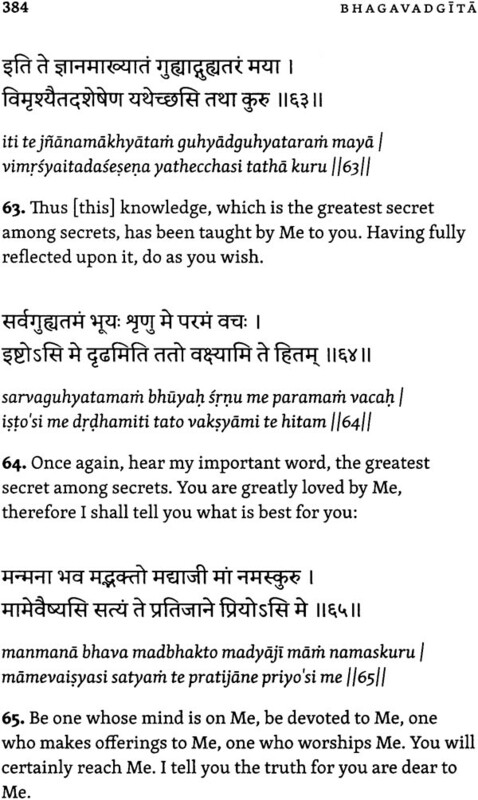 This latter part of the Vedas is comprised of the Upanisads, which is collectively called Vedanta, which means the end of the Vedas. 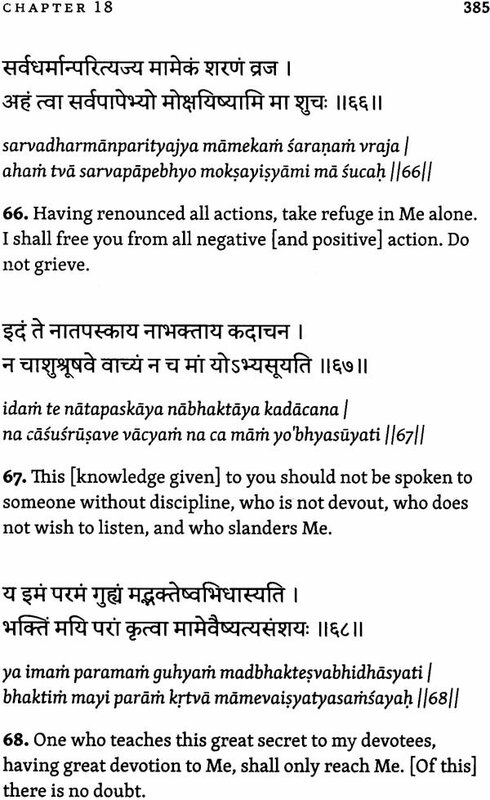 The Gita was composed after the Vedas,. The therefore it is part of the category called Smrti, "that which is remembered ",but its importance in terms of revealing knowledge places it at the same level of the Vedas, thus it is called the 5th Veda. It is as much a philosophical treatise – as far as it covers the individual, the Absolute, and the relationship between the two – as it is practical guide to everyday life, with instructions on how to act, how to deal with the mind, how to meditate, etc. The Gita is like a mother who welcomes us as we are with words of comfort regarding our limitations. It seems to come into our lives by chance – if you believe things actually happen by chance. In my case this chance happened in 1966, when I was doing an interchange program in the United Sates, where I found a copy in the library of the school I was attending. It was a paperback edition with an introduction by Aldous Huxley, a famous writer at the time. I knew nothing of Hinduism, but I quite liked Huxley; I had read some of his books. In his introduction, Huxley explained what he called Perennial Philosophy, which found expression, sometimes partial, sometimes complete, in different ways and in different cultures, be it in Vedanta, in the Hebrew prophecies, in the Tao, in the dialogues of Plato, in the Gospel of St. John, in the Buddhist Mahayana theology, in the Persian Sufis, in the Christian Mystics of the middle Ages and the Renaissance. According to Huxley, the Gita is the most systematic expression of Perennial Philosophy. The introduction captivated me and I brought a copy of this edition back with, to Brazil. The Vedic tradition is unique and incomparable. It is part of the patrimony of humanity for its approach on the various facets of human life and society. 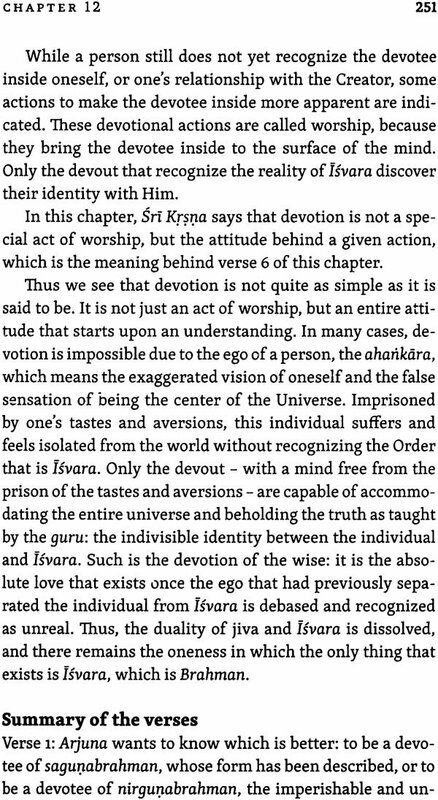 It is only within this tradition that the specific themes of dharma and moksa have been encountered with such septh and profoundness. 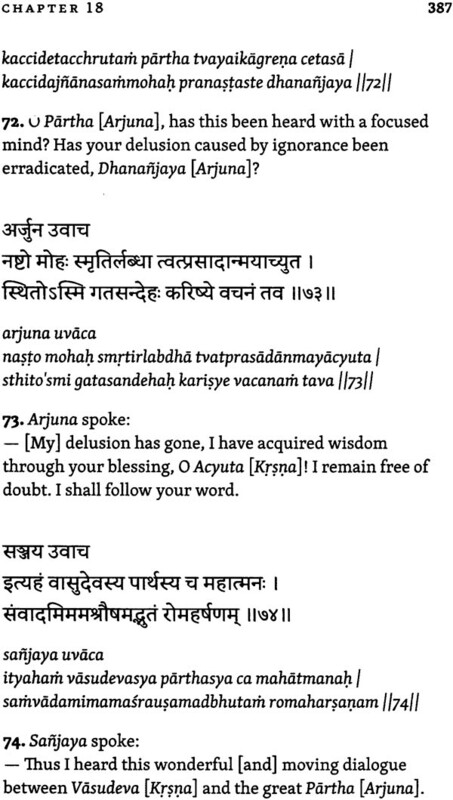 In the Vedic literature these words, as well as others, such sannyasa, and therefore sannyasin (one who lives a life of sannyasa), are unique and difficult to be translated. "That which sustains something or someone" is called dharma in Sanskrit and its three different meanings. Dharma is the role of each and every one of us, for as long as we have been included as individuals into various and different relationships. It is also the understanding and practice of ethics, of universal values. Lastly, dharma is the essential and immutable nature of everything. Revealing dharma, and inspiring the human being to follow it is, the object of the Vedas. Moksa is the human being liberation from the constant feeling of limitation and insufficiency. The liberation can be attained. The Vedas demonstrate the cause of suffering is due to the ignorance of the true nature of the Self. Revealing this knowledge of the Absolute – the essential nature of the human being, the Creator and the Universe all at once – is the main objective of the Vedas. Nothing can be found in any other sacred text that compares with regard to the dilemma of the human being and its solution. 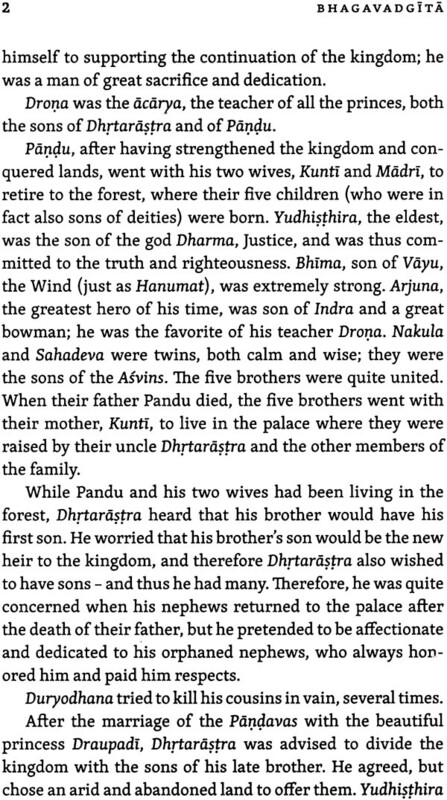 The Vedic society is divided into stages of life, or verna: brahmacarin (the student ), grhastha (the married householder), venaprasthe (one retired from family duties) and sannyasin (the enunciate). The sannyasin is one who leaves aside all ordinary duties, dedicating oneself to studies, meditation and teaching. It involves total dedication to a life of self-knowledge and to the renunciation of everything else. Nevertheless, if one – after completing much study – is prepared for and desirous of a life of total dedication to self-knowledge, ever if from young age, one may go through a ritual and become a sannyasin. Since the Vedas are very particular in enjoining human being to contribute to society an to its orderly maintenance, these stages of life were ordained to be strictly followed by everyone. In order to enjoy a harmonious society, one must do one's duty, dharma, Naturally, one may satisfy one's own desires, but only when desires are not in opposition to dharma. Thus, according to the Vedas, being a " drop-out" from society was not an option. Only an individual who has gone through all the three stages of life is entitled to leave aside all duties and dedicate oneself entirely to self-knowledge and a life of meditation – and it is role of society to support this individual in doing so. A sannyasin lives a life of sannyasa. Often this words is translate as and confused with a "mendicant" because this individual does not formally work, neither does this person receive a salary: all such an individual possesses has been given to him by society; whereas a mendicant in Western society is quite different: this person is often seen as rebellious or forfeiting. In Vedic society, all are happy to have a sannyasin among its members, since such an individual is committed to truth, to a quiet contemplative life, and to help and to inspire other members of society. From this standpoint, this individual is far from being a "drop-out". Sannyasa is also called tyaga, which means renunciation. 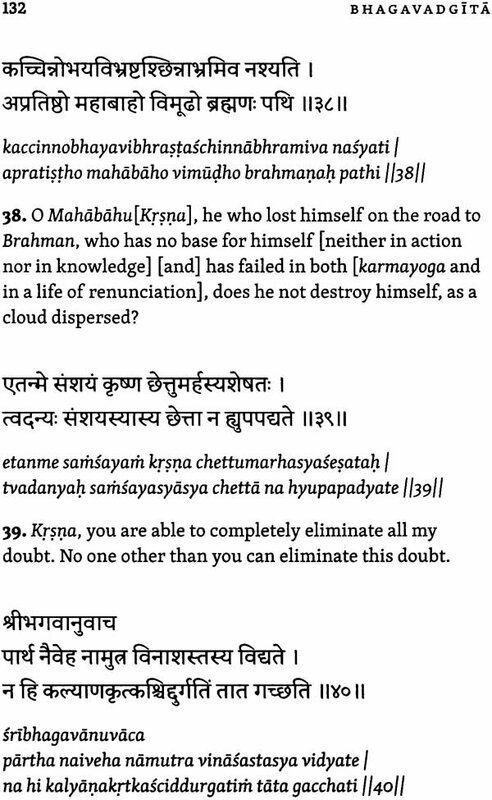 In the Vedas, renunciation is emphasized as a means for self-knowledge, but it is not just as simple as giving up or dropping out: it requires an emotional maturity, a preparation of the mind, and an analysis of one's utmost goal in life – besides the resolute certainty of how to reach this goal. This kings of renunciation is associated to the desire for moksa, which is freedom from the sense of limitation which can only be acquired through knowledge of oneself as being complete and not separate or different from isvara, the cause of the universe. 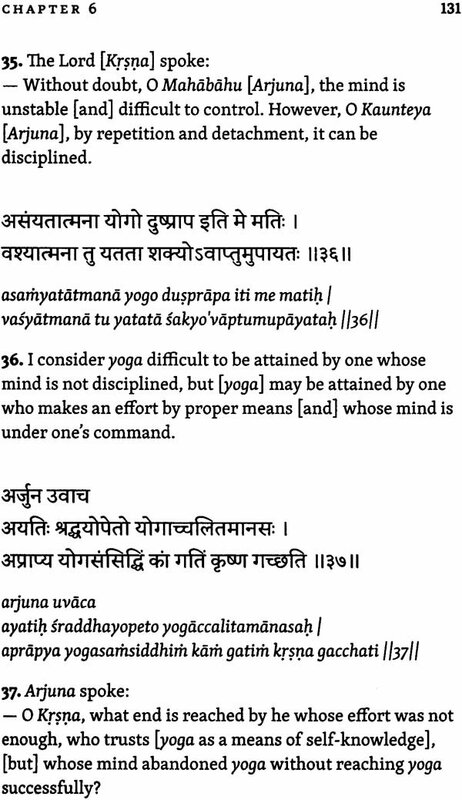 Sannuyasa, moksa and dharma are words particular to the Vedas, and we decided to maintain them in Sanskrit, in order not to present and opportunity for misunderstanding by fixing a single word as a translation. 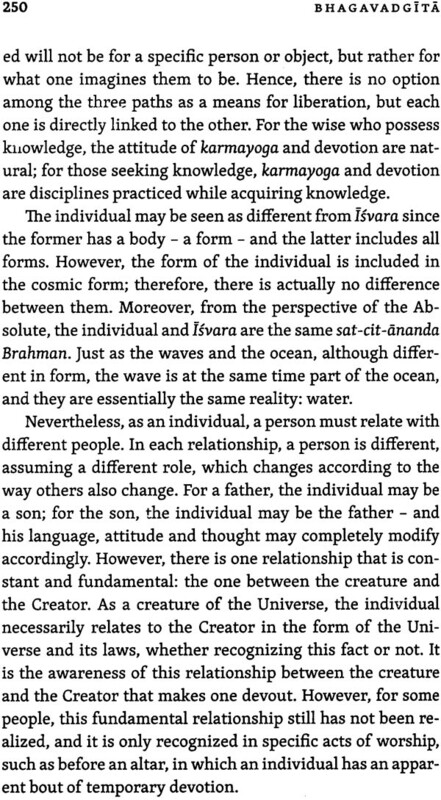 There are four Vedas: Rg, Sama, Yajur and Atharva – each of which can be divided into two parts. The first part teaches rituals and mantras, revealing appropriate and inappropriate actions according to one's role in life – denominated dharma and adharma, respectively – as well as their corresponding positive consequences, punyam, or negative consequences, papam. The Vedas emphazise that the human being is free to choose his or her actions, but the individual is bound to the results of his or her choices.